Guidance and policies for councillors and local authorities that promotes appropriate standards in the management of assets and high quality design in new work related to them, including public spaces. The aim of the guidance is to promote and encourage appropriate standards in the management ofÂ these assets and high quality design in new work related to them, including public spaces. English Heritage with others in the historic environment sector published in 2010 Pillars of the Community, a web-based guidance document aimed at both local authorities and community organisations. It will also be relevant to transfers from central government and other public sector bodies. This is being revised at present. This revised guidance by English Heritage, published in draft in 2011, sets out ways to manage change in a way that conserves and enhances historic areas through conservation area designation, appraisal and management. This English Heritage guidance document, published in 2012, sets out how to manage changes within the setting of heritage assets, including archaeological remains and historic buildings, sites, areas, and landscapes. Information from DCLG on what neighbourhood planning is, why it matters, how it works, and sources of advice and support available for communities. In addition there are the English Heritage guidance notes referred to above. Placecheck is a method of taking the first steps in deciding how to improve an area. Placechecks are often able to kick-start change in a way that might not otherwise be possible. They can lead community groups to do anything from litter clear-up days to neighbourhood planning. © St Pancras Renaissance Hotel. 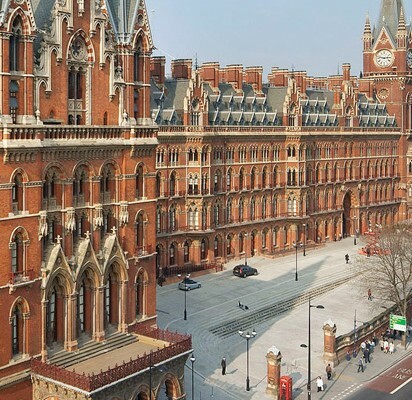 The St Pancras Renaissance Hotel opened in 2011 after years of restoration following decades of neglect.